Photos by, clockwise from top: Paula Crozier (top), Shane Morrissey (bottom left), and Yuhei Iida (bottom right). The moon jelly is easily recognized by the four conspicuous horseshoe or crescent moon-shaped gonads grouped in the centre of its bell. These may appear pinkish or purplish, yellowish, or white. The rest of the jellyfish appears light blue, white, or grey. The moon jelly's bell is wider than it is high, and it can be up to 40 cm in diameter - though is more commonly around 10-15 cm. The edges of the bell are scalloped into 8 major lobes; each major lobe is shallowly divided in two, creating 16 minor lobes. These lobes are fringed with short tentacles. This jelly is found in shallow pelagic areas of coastal waters, making it a common sight in nearshore waters, bays, and harbours. It is one of the abundant jellies in coastal BC waters, and is found along the west coast of North America from Alaska to California. It is also found in other temperate and tropical waters around the world, including coastal Japan, Europe, and eastern North America. 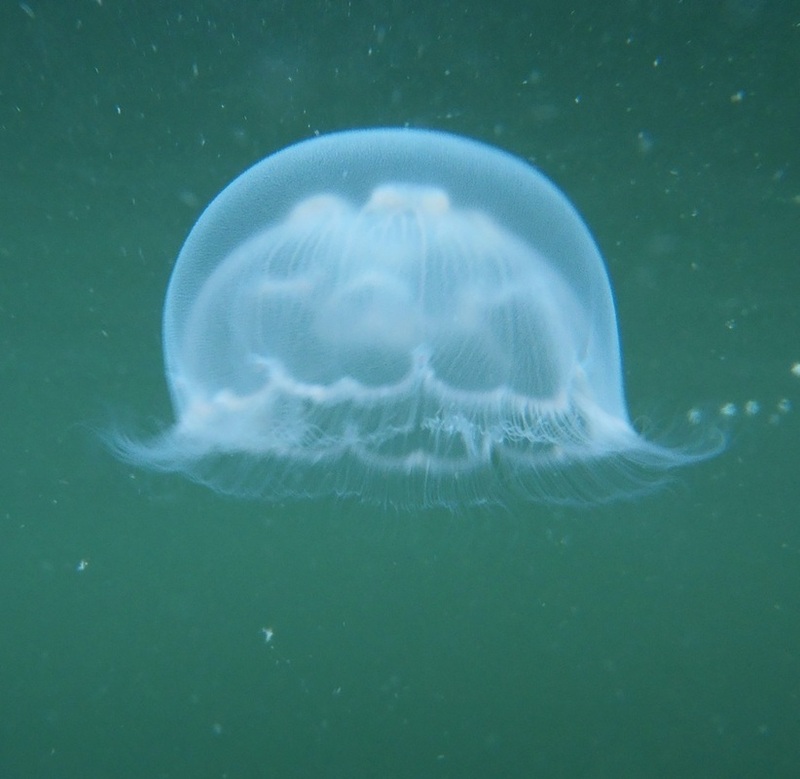 Aurelia aurita, or the common jellyfish, is found in the Atlantic Ocean and the Baltic Sea and was once thought to be the same species as Aurelia labiata. 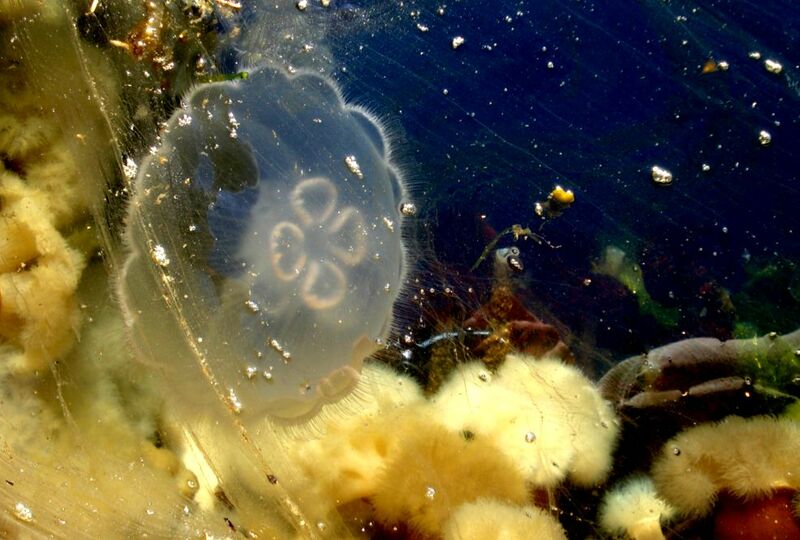 The brown-banded moon jelly (Aurelia limbata) is much less common than the moon jelly, and is distinguished by its dark brown margin and many-branched subumbrellar canals. This species is commonly found in aquariums. 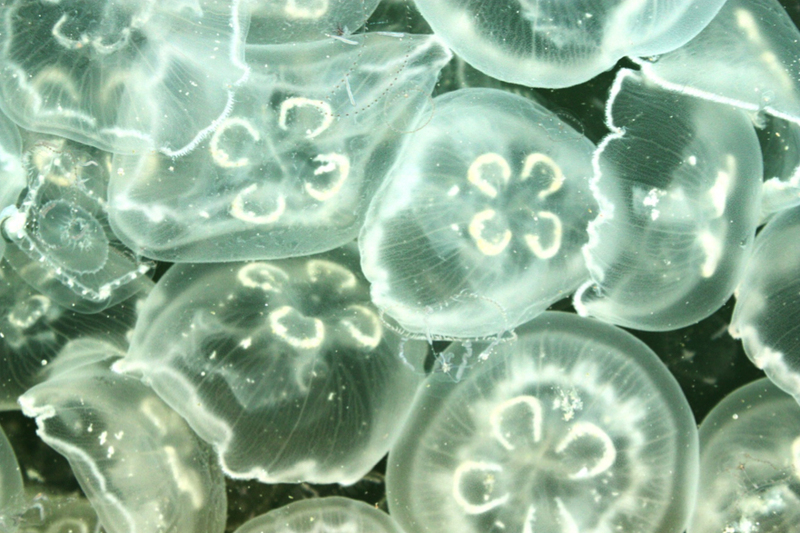 Moon jelly tentacles do not obviously sting, but can cause a rash if skin is exposed to enough tentacles. Plastic bags can look very similar to moon jellies, and so tend to be mistakenly eaten by moon jelly predators such as green sea turtles. The colour of a moon jelly depends on its diet. Brine shrimp give it a yellow tinge, while other crustaceans give it a pinkish or purplish tinge. Aurelia labiata Chamisso and Eysenhardt, 1821. In Klinkenberg, Brian. (Editor) 2012. E-Fauna BC: Electronic Atlas of the Fauna of British Columbia. Lab for Advanced Spatial Analysis, Department of Geography, University of British Columbia, Vancouver. Accessed 06/08/2013. Cowles, D. (2006). Aurelia labiata (Linnaeus, 1758). Invertebrates of the Salish Sea. Rosario Beach Marine Laboratory. Accessed 06/08/2013. Harbo, R. M. (1999). Whelks to whales: Coastal marine life of the Pacific Northwest. Madeira Park, BC: Harbour Publishing. P. 67. Moon jelly. Monterey Bay Aquarium. Monterey Bay Aquarium Foundation. Accessed 06/08/2013.